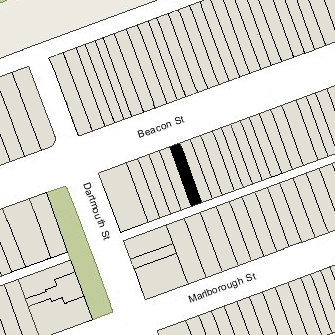 243 Beacon is located on the south side of Beacon, between Clarendon and Dartmouth, with 241 Beacon to the east and 245 Beacon to the west. 243 Beacon was built ca. 1868 for real estate dealer Henry Whitwell, for speculative sale, one of six contiguous houses (241-243-245-247-249-251 Beacon), designed as three matching and symmetrical pairs. 239 Beacon was built at the same time and in the same style; 253 Beacon (since destroyed) also was built at the same time and probably in the same style. Click here for an index to the deeds for 243 Beacon. By 1868, 243 Beacon was the home of banker George Baty Blake, Jr., and his wife, Harriet Davis (Johnson) Blake. They had married in January of 1867, and 243 Beacon may have been their first home together. The Blakes leased 243 Beacon until Novemebr 1, 1870, when he purchased the property from Henry Whitwell. Harriet Blake died in June of 1872. George Blake continued to live at 243 Beacon until 1876. 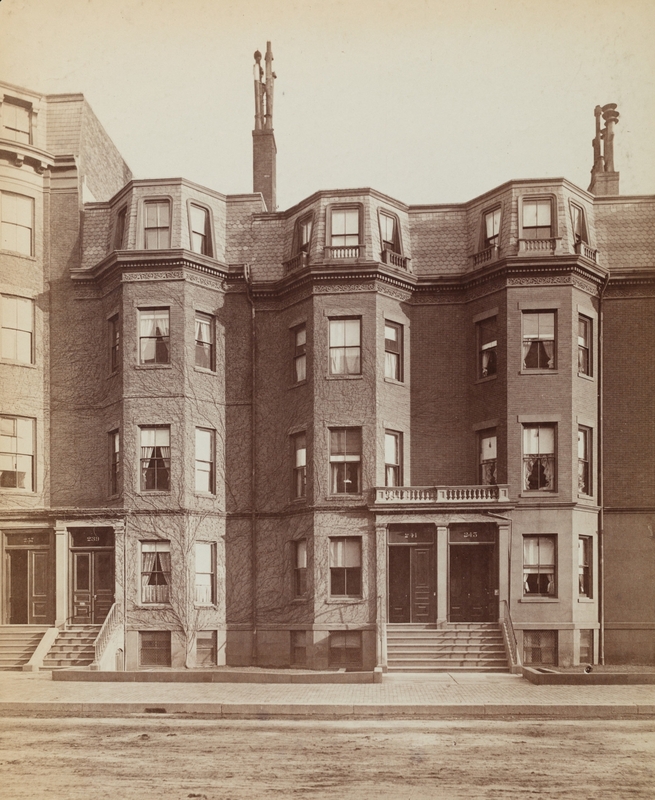 In May of 1876, he remarried, to Sarah Putnam Lowell, after their marriage, they lived at 22 Beacon. On September 20, 1875, 243 Beacon was purchased from George Baty Blake, Jr., by Miss Ada Medora Whitney. 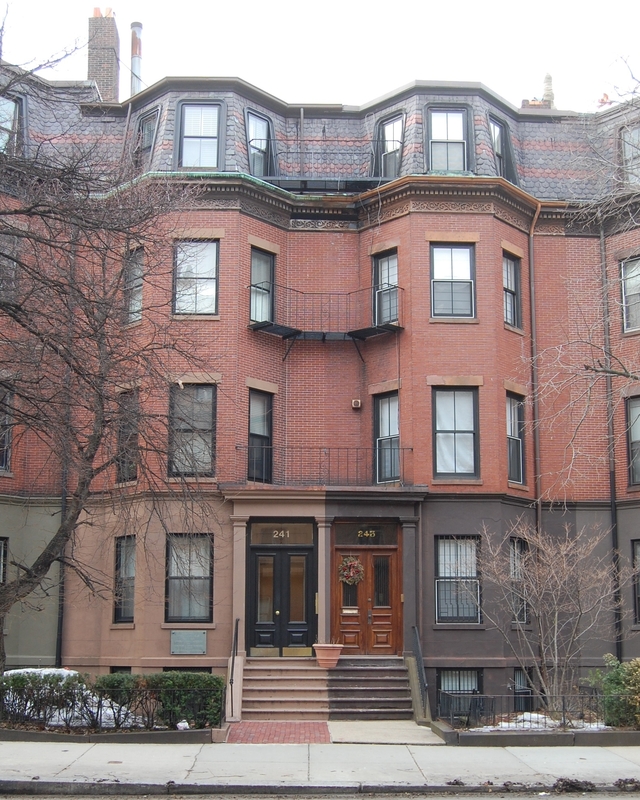 She was the daughter of lumber merchant and real estate investor (and owner of the Hotel Vendôme) Charles Whitney and his wife, Sarah Kimball (Bradley) Whitney, and probably lived with them at 306 Dartmouth. On February of 1876, she married George Gilbert Davis, a manufacturer of woolen machinery, and they made 243 Beacon their home. They also maintained a home in North Andover. 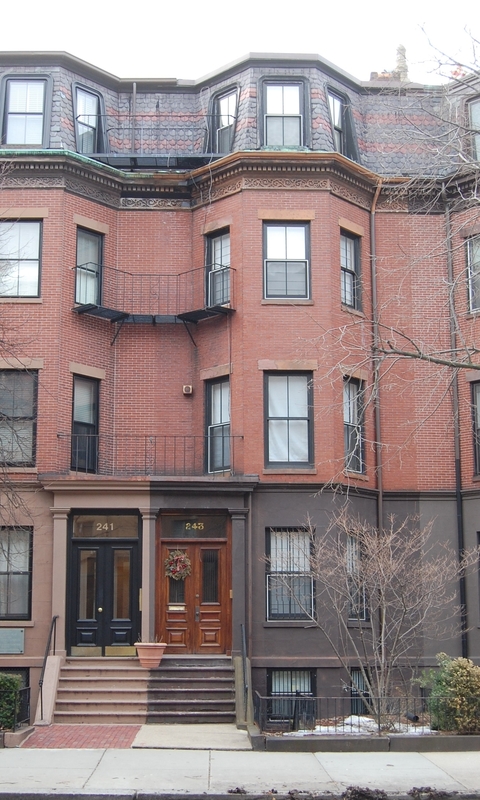 They continued to live at 243 Beacon during the 1903-904 winter season, after which they moved to 316 Beacon. On May 28, 1904, 243 Beacon was acquired from Ada Davis by Margaret (Farlow) Castle, the wife of William Richards Castle, Jr. They previously had lived in an apartment at 330 Dartmouth. William Castle was Assistant Dean of Harvard College and later would serve as Under Secretary of State in the Hoover Administration. The Castles continued to live at 243 Beacon until about 1917, when they moved to the Washington DC area and he became director of the Bureau of Communications for the American Red Cross. On January 17, 1920, 243 Beacon was purchased from Margaret Castle by Florence King (Brown) Twombly, the wife of attorney Howland Twombly. They previously had lived at 6 Otis Place. They also maintained a home, Bramble Lodge, on Eastern Point in Gloucester. They continued to live at 243 Beacon until his death in July of 1939. By 1940, it was the home of Henry Parkman, Jr., and his wife, Doris Montague (Leamy) Parkman. They previously had lived at 36 West Cedar. He was an attorney and corporate counsel to the City of Boston. In 1933, he had run for Mayor and in 1940 for US Senate. They continued to live at 243 Beacon in 1941, but moved soon thereafter to 30 West Cedar. 243 Beacon was shown as vacant in the 1942 City Directory, and in September of 1942, Florence Twombly applied for (and subsequently received) permission to convert the property into a lodging house. She continued to own the property and lease it to others. By 1947, 243 Beacon was the home of Katherine (Catherine) E. Markle, the widow of Albert Thurman Markle, who operated it as a lodging house. She previously had lived at 43 Gray. Her son and daughter-in-law, Albert John Markle and Dawn Elise (Rogers) Markle, lived with her. They previously had lived at 18 Winchester. He was a tea blender. On May 25, 1948, Albert and Dawn Markle purchaed 243 Beacon from Florence Twombly. On April 30, 1951, Albert Markle transferred his interest in 243 Beacon to Dawn Markle. The Markles separated in about 1953 and Albert Markle and his mother moved from 243 Beacon. Dawn Markle continued to live there in 1954. On October 22, 1954, 243 Beacon was acquired from Dawn Markle by her first cousin, Earl Leroy Worthington (Dawn Markle’s father, Clarence W. Rogers, was the brother of Earl Leroy Worthington’s mother, Helen Louise Rogers). On January 12, 1955, 243 Beacon was acquired from Earl Leroy Worthington by Joseph J. Kelly. At the time of the sale, Earl Leroy Worthington and his wife, Letha (Anderson) Worthington, lived in Oregon City, Oregon. She died in January of 1956 and in March of 1956 Earl Leroy Worthington married Dawn Markle. Joseph Kelly was a lawyer. He was unmarried and lived in Brighton. He continued to operate 243 Beacon as a lodging house. On June 23, 1970, Joseph Kelly transferred the property to himself and his brothers, James E. Kelly, Francis M. Kelly, and Edward N. Kelly. James Kelly died in October of 1971 and Francis Kelly died in August of 1975. On March 30, 1978, 243 Beacon was acquired from Joseph Kelly and Edward Kelly by Joseph J. Hoffman. That same month, he applied for (and subsequently received) permission to convert the property into four apartments. On January 31, 1985, 243 Beacon was purchased from Joseph Hoffman by Leroy J. Bellisario and Afarin Ordubadi. On August 31, 1995, they transferred the property to themselves as husband and wife. In March of 2009. Afarin Bellisario applied for (and subsequently received) permission to reduce the number of apartments from four to two. 243 Beacon remained a two-family dwelling in 2016.